I'm always excited when Cirque Colors releases a new collection. The polishes Annie makes are always so beautiful! When she released her last collection, Objet d'Art, I highlighted the holographic polishes separately, and I thought I'd do the same for her newest collection, Arcus. Bejeweled is a killer royal blue with a very strong holographic effect. It's deep and rich and beautiful, indoors or out. It doesn't have the "greyed out" problem that plagues many other holos. Two coats. 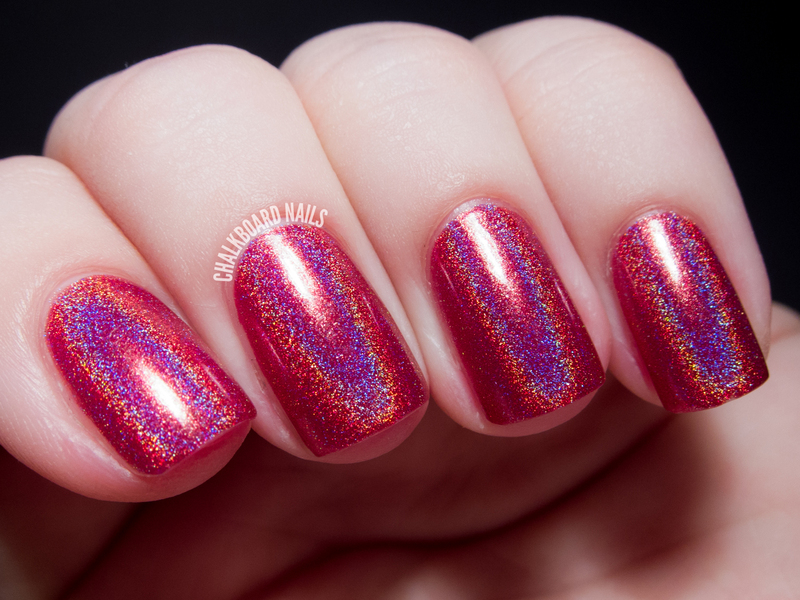 Vesuvius is a strawberry red with an equally strong holographic effect. In person, this polish looks a tiny bit more warm and coppery. It's beautiful indoors, and then you go outside and you are basically blinded by the holo. Two coats. These polishes are really great, and I think they will hold up nicely when compared with other holos. Unfortunately I haven't wear tested these yet, so I can't tell you how long they will last before chipping. What I CAN tell you though is that these polishes apply beautifully, without streaking, patchiness, or bald spots. No aqua base needed! As with all Cirque polishes, they are scented with lavender and clary sage essential oils. The scent is faint and just replaces the icky smell of nail polish. These holographic polishes retail for $15 at CirqueColors.com. You can also order Cirque via their international stockists. For more information, keep up with the brand on Facebook, Twitter, and Instagram. Annie's polishes are always so gorgeous!! I have Vesuvius and I really need to give it a try.